PCs with all-in-one (AIO) designs have become more common in recent years - so much so that market watcher IDC has given the form factor its own category. Beijing-based Lenovo, the biggest PC marker in the world, sits at the top of it and is looking to cement its position there with the release of four new models toting space-saving designs. The B750 is the standout offering of the quartet, a 29-inch AIO with a cinematic 21:9 "super-widescreen" frameless IPS panel. It can be equipped with a 1GB Nvidia GTX760A GPU to help drive its 2560 x 1080 resolution display, which can be backed up with a processor that spans to a fourth generation Intel Core i7. Features onboard to help you make the most of its wide dimensions include Lenovo split screen, which lets you work with several windows at the same time. Lenovo is also looking to bring its A-game with the aluminimum-clad A540, a slim-styled AIO that the company says can be used flat like a table or upright like a regular PC monitor. 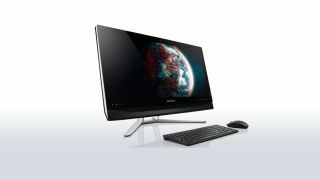 Its 23-inch full HD (1920 x 1080) IPS measures 21.55mm at its thickest point and totes 10-point touch. The A540 can be configured with up to a fourth generation Intel Core i7 processor, a max of 8GB DDR3 memory and up to a 1TB HDD or 1TB SSHD hybrid storage. Last to walk through the curtain are two AIO PCs in Lenovo's B-series, the 23-inch B550 and 21.5-inch B350, which offer full HD (1920 x 1080) IPS displays with a widescreen 21:9 aspect ratio. They also get Intel's fourth generation Haswell processor and up to Intel Core i7 processors paired with up to 15GB RAM. Storage options on offer are 2TB HDDs or a SSHD hybrid option. Connectivity options include Wi-Fi and Bluetooth, HDMI out and an optical drive. All of the PCs will be available to buy from October on Lenovo's website. The A530 will set you back at least $1,009 (around £623, AU$1,075), with the B750 coming in at US$1,199 (around £740, AU$1,277), and the B550 at US$799 (around £493, AU$850). Pricing and availability of the B530 is yet to be confirmed. How can you make sure what the right PC is for you?